No Frizz Shampoo (retail- $24.99 for 8 fl oz) contains a new anti-frizz technology to do what silicones can't: eliminate frizzy hair by blocking humidity without weighing hair down. No Frizz Shampoo leaves hair incredibly soft, smooth and frizz-free. It's also perfect for colored hair. It is sulfate free but produces a rich, yet gentle lather. No Frizz Conditioner (retail: $24.99 for 8 fl oz) leaves hair deeply conditioned, smooth and frizz-free. Straight or curly, the conditioner leaves hair with a healthy shine. It leaves no heavy build up or residue, just smooth, more manageable hair. No Frizz Nourishing Styling Cream (retail: $26 for 4 fl oz) is a superb styling cream that smooths, conditions, and eliminates frizz by blocking humidity without weighing hair down. 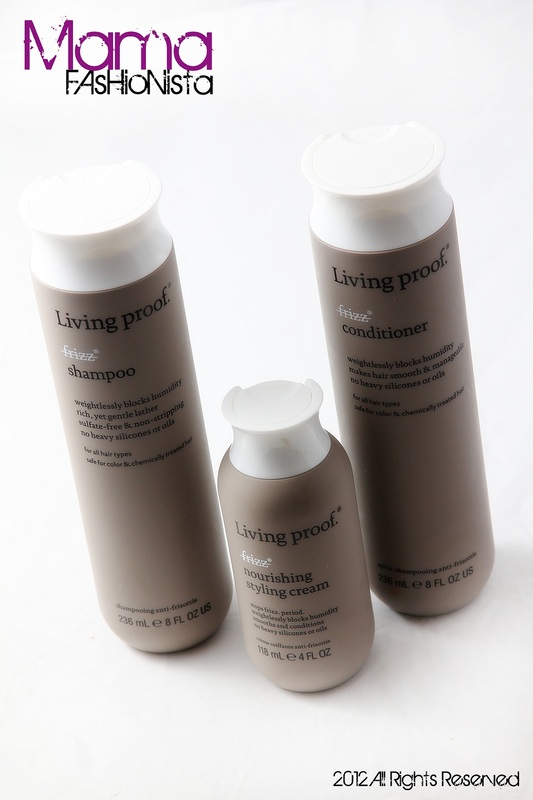 It gets its edge from Living Proof's miracle molecule, PolyfluoroEster, to create a weightless shield on hair that blocks humidity absorption, smooths the cuticle, and repels dirt. The PolyfluoroEster shield is established over the first five uses of the No Frizz regimen, so it becomes stronger, the longer you use it–and can be maintained with consistent use of No Frizz products. The Nourishing Styling Cream contains no parabens, sulfates, synthetic dyes, petrochemicals, phthalates, GMOs, or triclosan. No Frizz Shampoo, Conditioner and Leave-In Conditioner create a healthy foundation and help block humidity. When the complete No Frizz regimen is used together, hair stays cleaner longer and is so well protected that frizz is kept at bay even on the days you don't wash and style. I LOVED the entire system! All of the formulas were so rich and creamy: the shampoo lathered well, the conditioner was perfect for finger detangling, and the styling cream was the true star of the show. It might even hold HG status. All of the products smelled like white tea and ginger-deliciously pleasant and delicate and the scent lingered. I couldn't stop smelling my hair. My curls were bouncy, shiny ringlets that had great definition and body. This line is a definite must have for every curly girl and any girl that struggles with the frizzies.